Who was the X-ray or scan arranged by? This statistic displays the share of healthcare professionals responsible for organising an X-ray or scan in the United Kingdom (UK) in 2015-2016. 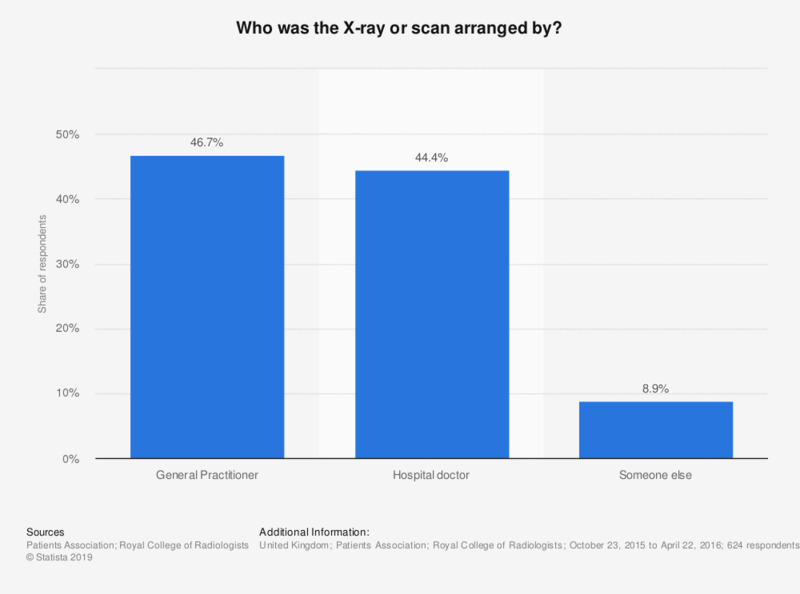 The majority of X-rays and scans were organised by the individual's GP at 46.7 percent, followed by a hospital doctor at 8.9 percent. Who do you think was responsible for interpreting (reporting) your X-ray or scan? Did you see a report of the X-ray or scan result in writing? When you received the result of your scan or X-ray, was it explained to you? The Government is thinking of introducing arrangements for patients to receive direct results of their X-rays and scans. Do you think this is a good idea?